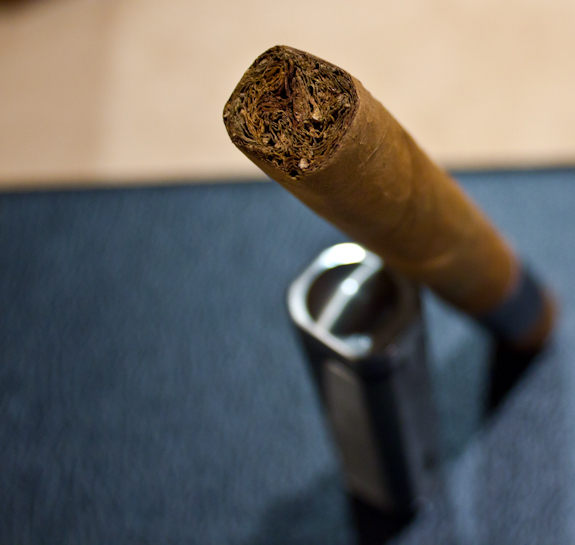 The cigar I settled with was the Angelenos Toro from 2009. Now the Angelenos is an interesting prospect. It’s not really the company name, and it’s not really cigar line name, but it’s sort of a mixture of both. The founder of Angelenos is Keith K. Park whose name you might recognize from Prometheus as well as a couple other brands such as God of Fire and Sencillo. If you visit the Angelenos website, Keith K. Park has a nice letter detailing the “why” of Angelenos and about what the name means. 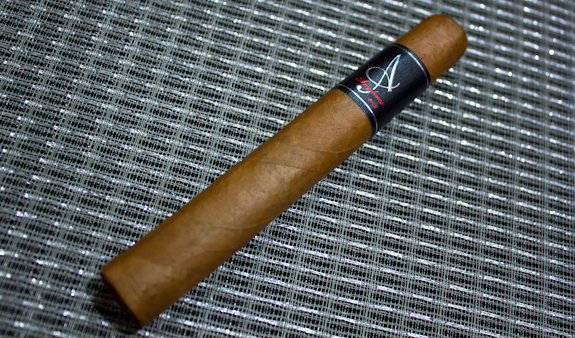 As a quick summary, the Angelenos cigar was created to honor Los Angeles (a.k.a the “City of Angels”). He feels the Los Angeles is home to a great number of passionate cigar lovers and wanted to create something for all of them. 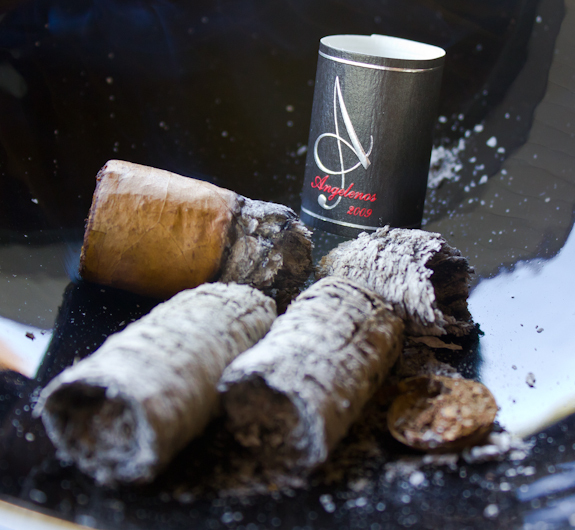 The Angelenos cigars are wrapped in an Ecuadorian leaf and rounded out with Dominican binders and fillers. 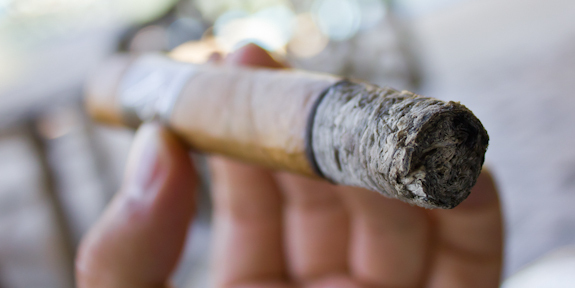 The cigar itself is rolled in the Tabaccalera A. Fuente y Cia factory which is located in the Dominican Republic. you may recognize the Fuente name in that factory, and it is indeed the factory where Arturo Fuente cigars are produced. One neat thing to note about these cigars is that the band has a year inscribed on them in red. This particular Angelenos has “2009” on it. Would be great to see more manufacturers adopt this style! In a lot of my cigars I’ve come to associate the Ecuadorian wrappers as something that packs a punch. This is most likely just by chance and the choice of cigars that I’ve smoked, but that’s just what pops into my head when I think Ecuadorian wrapper. Now from some basic reading I know this is not the case with the Angelenos and the website promises me a smooth and relaxing cigar. 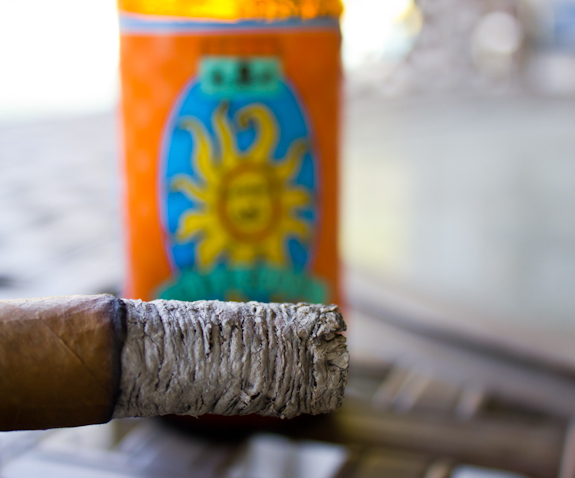 A quick note that this cigar was sent to us from our good friends over at Smoke Inn. Check their site when you have a moment, they have a great selection of cigars! So, Will the Angelenos live up to this claim? Time to read on and find out! •	Not having much to say is a good thing here, not problems to report! •	The next ash help on beautifully past the 2 inch mark with very little effort! 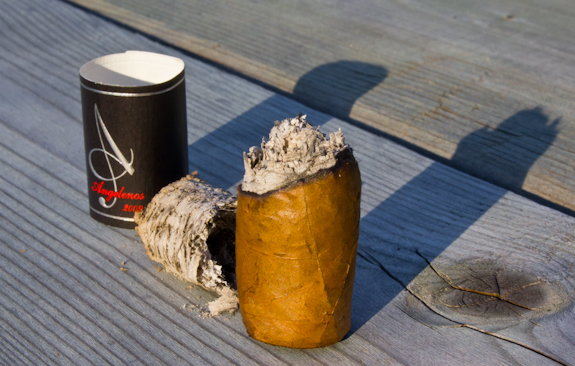 The Angelenos makes for a very nice smoke and can be enjoyed pretty much anytime of the day. If you like to enjoy an early day or morning cigar, this would go well with a cup of coffee or it can hold it’s own in the evening as well. The flavors were not multi-dimensional but they were enjoyable and I didn’t really get bored of them. Maybe a longer vitola might lose it’s appeal but in a Toro size or similar it’s a good smoke. The burn was also top-notch with no issues from start to finish, that always earns extra points in my book. 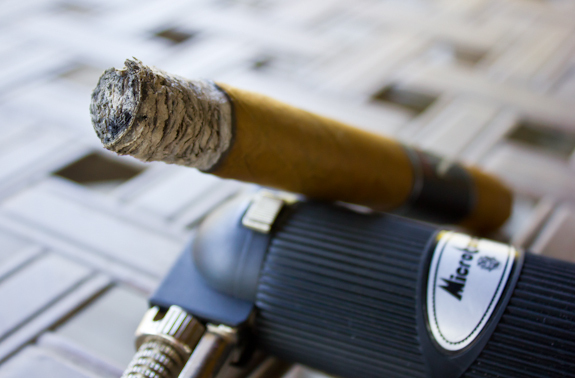 I like to work, read or watch a movie while I enjoy my cigar and if I’m fighting to keep it lit or touch it up, it ruins the experience for me. The classic flavors of cedar and coffee are also very easy to enjoy and pick up on for any level of smoker to enjoy. 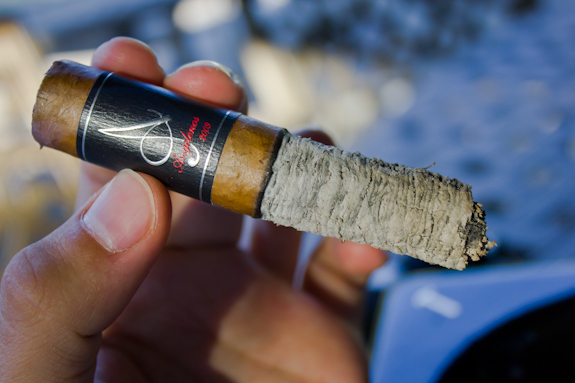 My main gripe here is probably the price, it seems a little high for this type of cigar with a straightforward profile. With that said, the price isn’t out of this world and still accessible. 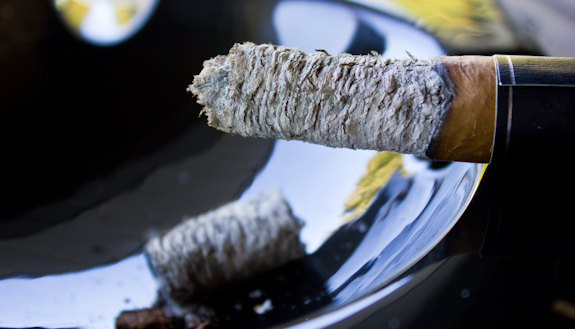 They are worth buying at least a 5-pack to have around when you need a nice relaxing smoke. Today’s brew is another one of my imports from my trip to Florida. It from Bell’s Brewery Inc. located in Missouri and it’s called Oberon Ale. The Oberon Ale is actually a summer seasonal and I probably should have drank it earlier but this weekend turned out to have some awesome summer-like weather so I popped it open. The beer has nice light color to it and is obviously not filtered since it is cloudy and has some particles floating around in it. I also found it to be a little more carbonated than normal although that didn’t really bother me. The flavor is very bright as soon as it hits your tongue, definitely a lot of fruity notes but they aren’t overpoweringly sweet. The beer still has a nice medium body to it and a tasty malty finish. This makes for an excellent summer beer that isn’t all clear and watery like some other summer beers are. I definitely enjoyed it and will look for more next time I head south. As for a pairing, I found it made a good partner with the Angelenos. Although you have to be selective with this brew, a nice connecticut or mild maduro would go well. 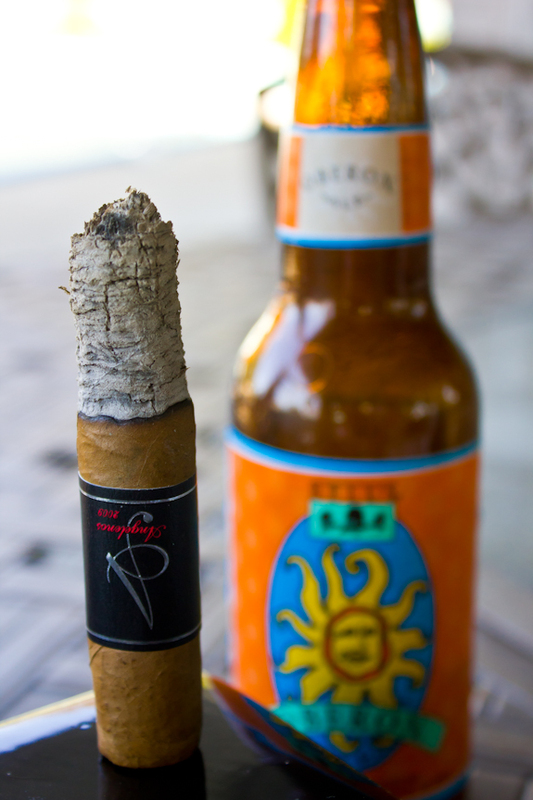 If the cigar is too far into the medium or full range the beer probably won’t stack up as well. 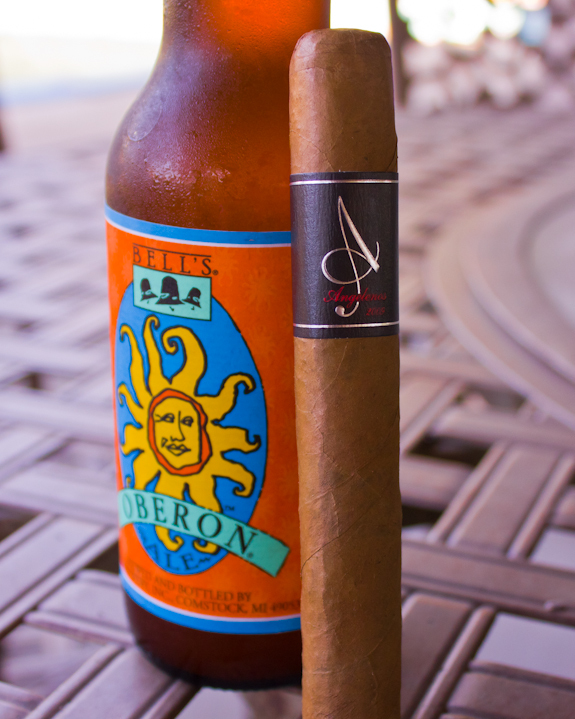 As for the Angelenos, this is a good option along with a smooth dark ale or possibly a nice coffee as a morning smoke. Hey Dan I have always heard they make great products, I actually have a Prometheus Angelenos Lighter and I love it, I haven’t however got the chance to try any of their sticks. Great review, enjoy the weather. I haven’t had a chance to try much from Prometheus but if the Angelenos is any indication I have high hopes. I also know they got some good press from the God of Fire cigars. Let me know if you get a chance to try them and what you think! Nice review, Daniel. I had one of these a couple of months ago (courtesy of Tony). I smoked it in the afternoon, and wished that I had saved it for morning instead. It was well made and smooth, but very mild. The ash was also pretty flaky. I did enjoy it, and it would go well with a morning coffee, but had I paid the MSRP on it, I would have been somewhat disappointed. There are a lot of good mild smokes out there for much less than ten bucks. haha seems we have the same opinion on this one Jeff. Like you said, it was good and mild but not exactly up to par with a $10 smoke. If they were in the sweet spot around $5 or $6 I think they would be a real competitor against sticks like Oliva’s Connecticut or the new EPC New Wave. Construction was nice but I was really hoping for more variation in the flavors. It’s not a bad smoke, but it just didn’t really strike a memorable chord with me. Sounds like we got a similar idea here. If it was cheaper I think it could have changed my mind a bit but at this price it hurt it’s own chances. Thanks for the comment!